Professor Alison Young will give a talk at City University London focusing on society's unresolved anxieties about images of crime. Her lecture, entitled 'Imagined Boundaries: the Troubled Relationship between Crime, Law and Spectatorship', will explore responses to illicit street art, 'sexting' and forensic images of crime. 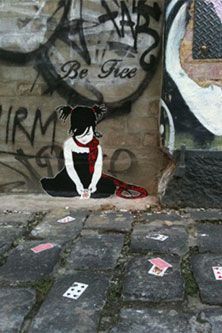 "Street art, when placed on private property without permission is still illegal, and the very similar activities known as graffiti are still considered to be 'vandalism' or 'anti-social'. The work of street artists such as Banksy, sell at auction for high prices, while those engaged in 'graffiti' are likely to be criminalised. Practitioners of street art still engage in illicit activities but the resulting artworks have become collectable aesthetic commodities. It's a paradox that challenges conventional understandings of culture, law, crime and art". "We can never simply be at ease with our anxieties, so instead we have to try and solve them using a variety of different tools; some of which might be to do with the law and some of which might be to do with social policy. In all of this, we very rarely think of ourselves as spectators who are in a relationship with the image - we bring as many anxieties to the image as we might be able to locate in the image itself". As an Honorary Visiting Professor, Alison will visit City on a regular basis in order to engage with staff and students as well as collaborate on research projects at the University. She is currently carrying out an Australian Research Council Discovery Project examining the reception of street art in the cultural field. 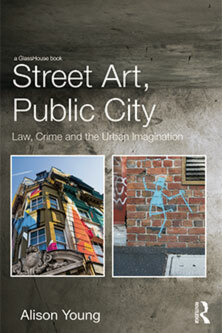 It focuses on its transformative potential in urban space; its reception and interpretation in the domain of fine arts; and its impact upon the socio-legal regulation of public spaces. Professor Young has an LLB (Hons) from Edinburgh University and a Masters and PhD in Criminology from University of Cambridge. She is the author of Street Art, Public City (2014) pictured left, The Scene of Violence (2010), Street/Studio (2010), Judging the Image (2005), Imagining Crime (1996), and Femininity in Dissnet (1990), as well as numerous articles on the intersections of law, crime and culture. She has also provided policy advice and acted as consultant for a range of organisations, including the Victorian Law Reform Commission and Melbourne City Council.